On the morning of 12th June we left the hotel at 5:30 AM for Denpasar domestic airport to join the Air Asia flight to Yogyakarta. Yogyakarta is the capital of one of the administrative regions of Java island of Indonesia. It is a popular tourist place in Java due to its proximity to temples of Prambanan and Borobudur. Pedalling rickshaws and horse-drawn carts ply in this city besides taxis. This region has also been affected by earthquakes and volcanic eruptions. As late as 2006, there was a big earthquake near the city claiming more than 6000 lives. Prambanan temple bears the scars of the earthquake. As late as 2010, the nearby volcano Mt. Merapi erupted spewing ash all over the nearby villages. Borobudur temple was also affected by the rain of volcanic ash. Though it is also known for its handicrafts like Bali you can see the striking difference between the two even as you enter the city. Tour driver Siddique greeted us with the vehicle at the airport. He can communicate in a limited way in English. As English speaking guides at Prambanan temple, Borobudur temple and Sultan’s palace were part of the tour charges, this did not much affect us. Our first place of visit was Prambanan temple compound. The guide here, Hari, was a well-informed person and he was easily the best guide we met in the whole tour. The temple compound is situated in a park and is about 17 kilometres from city centre. The temple compound is a UNESCO World Heritage site. This is one of the biggest Hindu temple in Southeast Asia and the largest Hindu temple site in Indonesia. In its heyday in 10th century the compound is said to have housed nearly 240 temples, major and minor and now we have only 6 major temples devoted to Trimurthy i.e. Siva, Vishnu, and Brahma and their Vahanas Nandi, Garuda and Hamsa besides 7 small shrines. The temple complex consists of three zones, the innermost the holiest zone contain the temples for Trimurthy besides other shrines. These are also reconstructed temples as the original temples collapsed in an earthquake in 16th century and we can see boulders and carvings strewn all over. The temples were again damaged during the 2006 earthquake and was closed to visitors for some time for repairs. Of these the tallest and and most important temple is that of Siva Mahahadeva, the ParaBrahman. In fact this word ParaBrahman has been corrupted as Prambanan. The Shiva temple is the tallest and largest structure in Prambanan complex. It is around 47 meters i.e.150 ft. high and it is quite a climb to reach the main shrine. Besides the main shrine for Lord Siva, there are also shrines for Goddess Durga, Lord Ganesa and Sage Agasthya, whom they believe as Guru of Lord Siva. This temple is equipped with galleries where the story of Ramayana is carved on the inner walls. We can follow the story when we do outer pradakshina of the inner shrines. For the other temples also you have to climb a number of steps though not as much as in this temple. The temples for Lord Vishnu and Lord Brahma are of lesser height and each has one shrine only. The temples for vahanas are of still lesser height and they face their respective main temples. After climbing the steps of temples for Trimurthy and of Nandhikeswar, we had no mind to explore others, as we had to conserve energy for climbing the steps in Borobudur. From Prambanan temple compound we went to Sultan’s palace which is called Kraton, locally. The palace is the residence of Sultan of Yogyakarta who is Head of the Special Region of Yogyakarta and bears the title of Governor. The palace is not only the residence of Sultan and his family but is also a cultural centre besides being the political centre. It has a museum that contains the gifts received from various countries, portraits of former Sultans and their life-events and also Gamelan instruments. Gamelan is a traditional Javanese orchestra dominated by percussion instruments. Besides the museum there is also an ornamental reception hall, spacious courtyard and a pavilion with seating arrangements where cultural shows are held. As it was the holy month of Ramzan, when we went, there was only readings from religious scriptures in the pavilion. Entrance to the palace is by ticket, which also covers the cultural shows when held. After lunch we went to Borobudur, which is about 40 Kilometres from Yogyakarta. Borobudur is one of the greatest Buddhist monuments. It stands on the top of a hill surrounded by volcanoes and overlooking green fields. It is a UNESCO World Heritage site. It is a three tiered structure with a great Stupa at the top standing 40 meters i.e. 128 ft above the ground. It is surrounded by numerous small stupas containing statues of Buddha. Base tier consists of five concentric square terraces and the middle three circular platforms. These have a philosophical significance. The base represents the sphere of desires, the middle sphere of forms and crossing both we reach the top sphere of formlessness, signifying Nirvana. 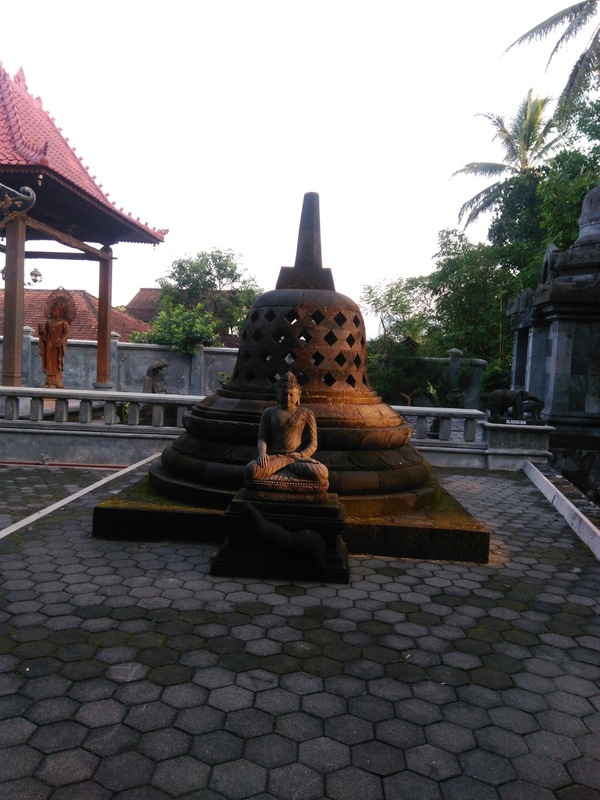 The temple is contemporaneous with Prambanan temple complex and it also fell into disuse and neglect when there was mass conversion to Islam in the island in 15th century. 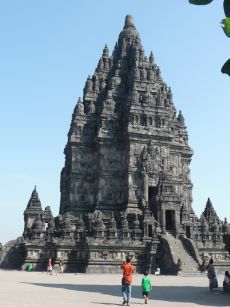 This as well as Prambanan temple were rediscovered when the island was under British administration for a short period after the Anglo-Dutch Java war, by the then British Governor, Thomas Stamford Raffles. The walls and balustrades are decorated with fine reliefs. In 2010, when Mount Merapi erupted, volcanic ash in large scale fell on the monument and it was closed to visitors for some time when restoration work took place. From Borobudur temple we went to two other Buddhist temples nearby which are said to have a ritual relationship with the main temple of Borobudur. These are also at a height and a flight of stairs have to be negotiated to reach the top. In Pawon temple there was no idol in the shrine at the top and we could see only the carvings of Bodhisattvas, kinnara-kinnari and Kalpataru in the outer walls. In the Mendut temple we could see the three metre tall Buddha seated on a throne flanked by two Bodhisattvas besides the beautiful carvings in the outer wall. There is a nice garden attached to this temple and also a monastery which seems to be a recent building. At the front of the building is a large statue of sleeping Buddha and at the back a statue of Buddha sitting in padmasana before a Stupa. It was very calm and peaceful there, ideal for meditation, but we didn't see any monk there. We were told Chanting takes place every day there in the late evening. From Mendut temple we made our return to Yogyakarta where we had our dinner and proceeded to airport to catch the night flight to Denpasar. We reached our hotel at 12 p.m. in the night, to rest after a tiring day of pleasant memories. Japan, Land of the Rising Sun - 3.